This Is Your Captain Speaking: Big Airlines buy Smaller Jets: Should Regional Airlines Worry? Big Airlines buy Smaller Jets: Should Regional Airlines Worry? The airline business model for the past decade or so has depended on the big six (now three) network carriers flying larger narrow and widebody aircraft to and from fortress hubs while outsourcing regional flying to lower cost regional partner airlines through capacity purchase agreements (CPAs). This model was driven by both the introduction of new and capable 50 to 70 seat regional jets (RJs), and also the need to compete with low cost competitors such as Southwest and America West. By the late 90s, network carriers had found themselves hamstrung by union pay scales and work rules when attempting to compete with the fast growing low cost carriers (LCCs) unleashed by deregulation. Competitive responses such as United's Shuttle by United and Ted, Delta's Delta Express and Song, and Continental's Continental Lite were all terminated after lackluster economic results. As I detailed in an earlier post, partnerships with regional airlines who operate under the brand of the mainline carriers allowed a competitive response to LCC incursion by circumventing high labor costs and work rules. Loopholes in union contracts at the mainline carriers allowed for the outsourcing of this flying. This model, however, may no longer be working. In the past year or two we've seen increased interest in regional aircraft by mainline carriers which suggests that the mainline carriers wish to bring at least some of their regional flying back in-house. One of the first accessions was by Delta of all the Boeing 717 aircraft that Southwest had acquired in its merger with AirTran. The 717 is a smaller, 100 seat variant of the MD-80 line and a highly desired aircraft as it fills the niche between RJ aircraft and larger narrowbody jets like the 737. The next move by Delta was its attempt to reach a contract with its pilots last summer that included the purchase of 20 Embraer E-190 regional jets. This would have been the first time that Delta operated regional aircraft in its mainline operation using its own pilots and not a regional partner. That contract was rejected by the pilots for reasons mostly unrelated to the RJ purchase, but it could be assumed that Delta was still interested in those aircraft. And as we shall see, they were. Next up was United who last fall made an unsolicited offer to their pilot's union to reopen their recently negotiated contract. In a letter to the union, a senior vice-president mentioned that a successful conclusion of the negotiations would result in the acquisition of new small narrowbody (NSNB) aircraft to be flown by United mainline pilots. That contract extension was passed by the union. In recent weeks we've seen a flurry of smaller jet purchases by both Delta and United. 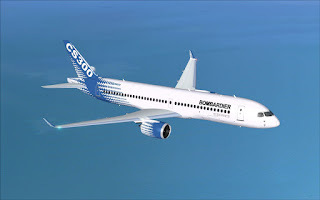 Delta is reportedly very close to a deal with Canadian aircraft manufacturer Bombardier for 75 of their new C-Series regional aircraft. These new and highly efficient aircraft come in two variants which will seat between 100-160 passengers depending upon model and interior configuration. This aircraft will fit nicely with their already existing 717s for the 100 seat market. And back in January United announced an order for 40 Boeing 737-700 aircraft. While the 737-700 is not considered a regional aircraft, United's configuration for its existing -700s is for 118 seats which puts it right in the middle of the pack for regional flying. They reportedly got the airplanes for a screaming deal of $20-25 million per plane which Bombardier, the other choice under consideration, simply couldn't match. Boeing has just launched the newer variant 737-Max and is giving United a deal to clear the last of the -700s off the lot as it were. American Airlines is in a somewhat different situation as they've owned their own regional airline, American Eagle (now Envoy) since buying out all their regional partners back in 1987. Apparently American was able to wrangle exceptions to the scope clauses in their union contracts allowing this arrangement. Already being the owner of their regional would seem to reduce the need for bringing that flying in-house. After American's bankruptcy and merger with USAir though, they have resumed American Eagle branded flights with a number of outside regional partners under capacity purchase agreements. The current model has worked for some time so why rock the boat and change things around now? There may be a few things going on here. The first one may have something to do with the cost of fuel. Let me explain. When regional airlines first started flying RJs, the 50 seat RJs were very popular and allowed network airlines to raid each other's hubs with these fast and relatively long range aircraft. Later, though, as the price of oil climbed through $100 a barrel, the aircraft became uneconomical to operate. The reason for this is that they cost just slightly less to purchase and operate as larger aircraft, but generate only a fraction of the revenue putting them at a disadvantage. Fuel is cheap now but airline managers realize it may not stay that way for long. This is one of the reasons regional airlines are retiring their fleets of 50 seaters and moving to aircraft with larger seating capacities. A second reason for the declining popularity of smaller regional airliners may have to do with limits on the capacity of the nation's airspace system. Slot limited airports such as Laguardia or Newark can only handle so many arrivals per hour. In order for an airline to increase revenue in a particular market like this, the only feasible means is by using higher capacity aircraft. Even at non slot restricted airports, a particular market may not support additional departures as most business travellers like to travel early in the morning or at the end of their day. Again, the only way to boost capacity in such a market without doubling costs by deploying a second aircraft is to use a larger aircraft. Lastly, there is an ongoing shortage of pilots to fly regional aircraft. Regional airline jobs are entry level jobs into the industry, and as the major airlines are on a hiring binge to replace retiring Baby Boom era pilots, the regionals are having trouble replacing their departing pilots with new hires. Also, by bringing their regional flying in-house, the network carriers may be attempting to gain control of their pilot pipelines. Once a pilot is on a seniority list, they are not likely to leave a particular airline as they have to start over at the bottom of the list. If one corporate entity controls both the regional and mainline flying and keeps their pilots on one seniority list, there will likely be less draw for them to jump ship to another carrier. There are many reasons for this dearth of pilots which I addressed here. The upshot is that regional airlines are having to make hefty boosts in pay and benefits to attract the diminishing pool of new pilots. This negates their cost advantage in comparison to the network carriers which is really their reason for existing in the first place. As regional aircraft size and capacity grows, the mainline network carriers will find themselves bumping up against their union contracts which require larger aircraft to be flown by mainline pilots. With no cost advantage and control of their pilot pipelines to be gained, it may be advantageous for the mainline network carriers to bring their regional flying back in-house thereby ending the era of outsourced regional flying. This may be a perfect storm of bad news for the operators of regional airlines, and one that they probably knew would eventually come.